Summers in the central valley aren’t much fun without a working AC, which is why we work overtime to provide quality air conditioning repair in Tracy and beyond. 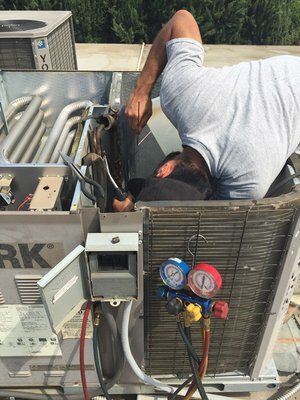 With superior workmanship, flexible appointment options, emergency air conditioning repair service, and pricing you can afford, we’re the team to get your system back on track in record time. Give us a call the next time your air conditioner needs a hand and we’re confident you’ll find your heating and air company for life. Why Call Us For Air Conditioning Repair? We can repair any part of your air conditioning system, including the condenser, ducts, thermostat, and wiring. We offer regular preventative maintenance plans that can prevent more costly repairs at a fraction of the price. Our labor is covered by a one year warranty. Our team is available for ac repairs throughout the greater Stockton area. We offer several other air conditioning services too, including new AC installation. Do you offer preventative AC maintenance? 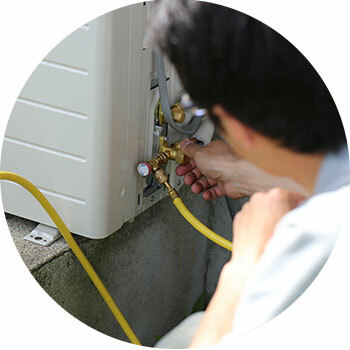 We offer annual, quarterly, and one-time AC service plans depending on the age of your system, the equipment you have installed, how often and how cool you run your system, and other factors that can impact wear and tear. Speak with one of our technicians today and see which plan is right for you. Air filters should be changed every three months. For homes with pets and allergy sufferers, you should change your filters more often. What can I do about a room that cools down too quickly? Sometimes rooms that are closer to the air conditioner will cool down quicker than the rest. Our technicians can install a damper in your ducts to ensure that more cool air gets to farther rooms, for a more consistently cooled home. Do you cover window systems or commercial systems? Absolutely. Our team services systems large and small, from ductless mini splits and window coolers to full scale commercial or multi-unit AC systems. Should I replace or repair my air conditioning system? It’s a question we hear all the time, and it all depends on your current AC unit and how often you run it. Your average AC condenser should last about 10 years and will become more expensive to repair over time. In general, if your air conditioning repair costs start to approach 1/2 the cost of the system itself, it’s typically more affordable to replace it altogether. The good news is, when you choose to replace your system, you can look forward to a more reliable system that runs stronger, with less electricity, and provides better air quality. New air conditioning systems also often come with 10 year warranties, which means you’ll be covered for a long time to come. When that time does come, however, we hope you’ll call us for your AC replacement needs, so you’ll know that your job is in good hands.